As usually happens this time of the month, Newsarama sneaks some of the solicits out for us. As if knowing what's coming up three months in advance, we now know three months and TWO DAYS earlier in some cases. The DP steps aside from appearing in The Brave and the Bold, but they do still have their book. 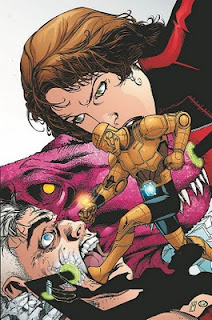 In what is sure to be a pivotal moment for the Doom Patrol - and Rita in particular, the sniffer expels itself from Rita's giant-sized hand. Not much of the hand remains intact following this episode. How this all plays out in next month's issue remains to be seen. I really like Clark's layout for this page. He does a nice job of giving pages a unique feel by dropping seemingly unrelated shapes in to add contrast and fight negative space. So I asked Matthew Clark if Ambush Bug would indeed be in the next issue of Doom Patrol. He answered me, one single word, three little letters. That's all I'm going to say about that. If the "he" were to equal "Ambush Bug" (hypothetically) then what would the "it" be? 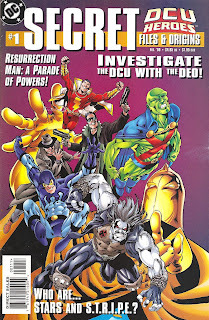 Conversely, if "he" is not "Ambush Bug", does "it" not exist? 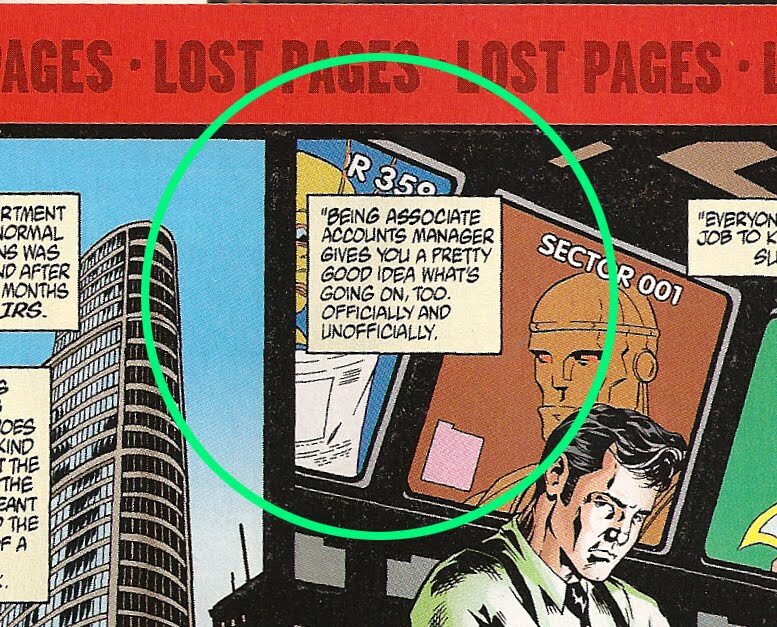 Tune in next time* as I take us way back to another time when "Doom Patrol" and "Ambush Bug" were mentioned in the same comic. 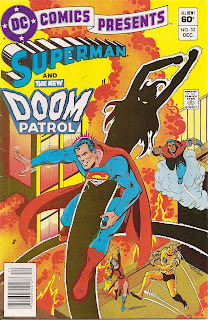 . .
You loyal followers of this lovely Doom Patrol blog may wonder where it is that I disappear to when not blogging. As my profile says, I'm the father of three and the husband of one, so there's where some of my time wonderfully fades away to, moreso lately as nice weather creeps onto the scene. I've also got a day job. Beyond that I'm writing a Red Tornado blog (yes, seriously) and I do reviews for Comic Book Resources. In advance, and with that said, I apologize for not posting every day, but there's some other options of where you can get a dose of Doug. Phillip Sloan-Thomas Munroe-Larry Trainor is being stalked. 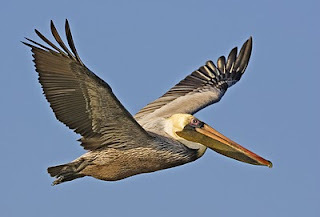 By a pelican. The exchange between Larry and Cliff - and the signpost behind Cliff - are absolutely priceless! Of course, whenever a moment like this pops up in DP, there's an explosion, alien invaders, or repo men from another dimension right around the corner. So it's not Friday, but it is another Elasti-Woman entry for y'all! I had every intent to post this last night, but spent some time with the family hound at the vet, which is no way to spend a Friday evening. 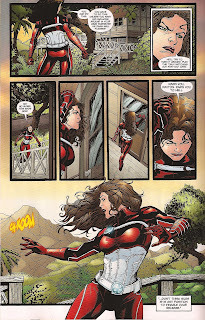 Anyway, here's one Rita page from the issue that just came out Wednesday. The art on this one is clearly from Ron Randall as opposed to Matthew Clark, but Livesay, in my opinion, did a fabulous job providing the visual glue to hold this issue together. 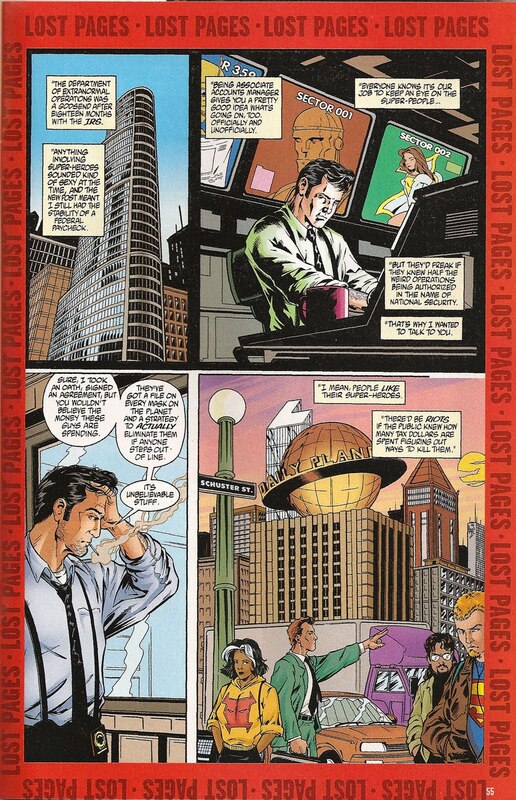 After the events of Blackest Night (which is in our future, two weeks or so from now) the Patrol retruns home, and Rita has a score to settle with a certain Mr. Steve Dayton. Lucky for Mento, there's an explosion that brings the core DP running to the Oolong airfield. 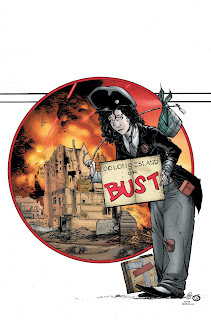 We've seen the preview at the end of issue #6, Rita's destined to have it out with Dayton. How that all plays out remains to be seen. One point of interest - at least to me - is the color shift in Rita's eyes. They were very green to start this series, but now they're rather olive, almost gray. 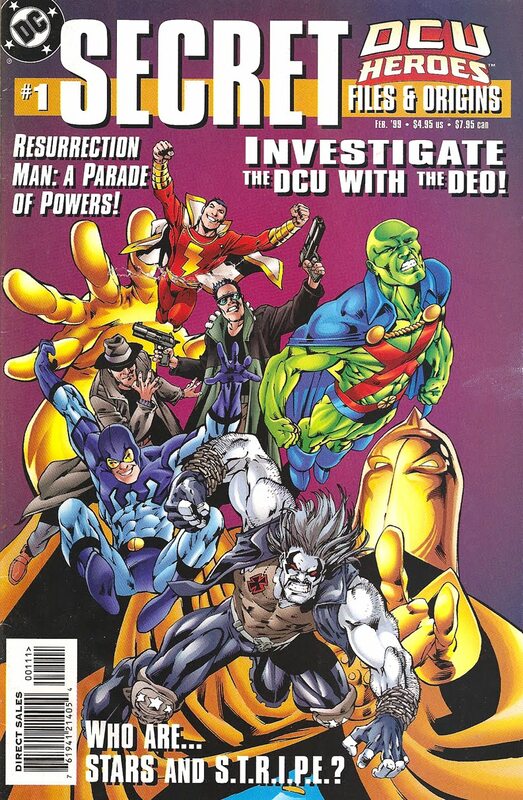 Keith Giffen made mention that there was some significance behind this, but what it truly is remains to be seen. I reviewed DP #8 and it's now up over at Comic Book Resources. DP a rather difficult time. Feel free to check out the review (among many, many others) over at CBR. Overall, for the first issue without a "second feature," I thought this issue did a good job of plowing into action. 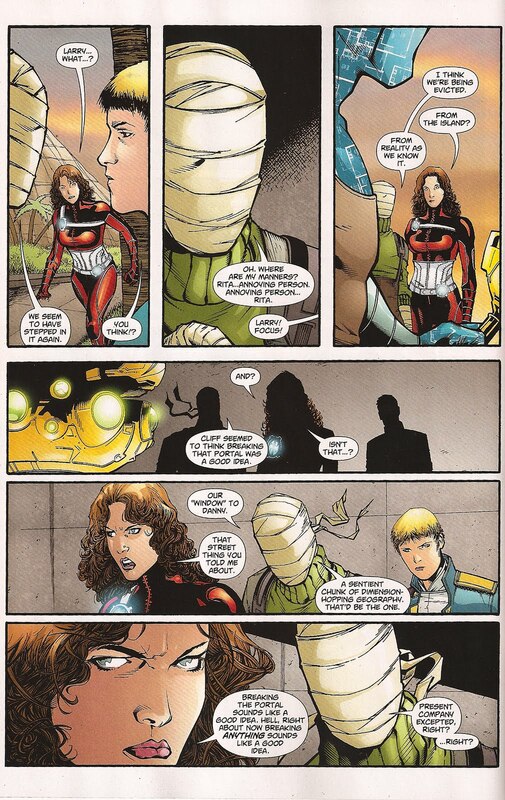 Negative Man is in top form and the rest of the crew isn't so bad either. Check back later today for the regularly scheduled Elasti-Woman Friday. Once again, the ever-accomodating Matthew Clark took some time to answer my ponderances. Which got me to thinking, I need a fun little tag for my semi-regular sessions with Mr. Clark. Any of you have any creative labels to throw on it? Pin them up in the comments section if you do, please. MGA: Why did the cover art change for issue #7? MC: It was an editorial decision made at the last minute, they were looking over the issue and the tone of it, and felt that the cover which EVERYONE loved wasn't the right image. It was a bit too cutesy. I was told its a great cover but with this being the first issue after Blackest Night the DP needed to be on the cover so I had the promo all inked and colored and ready to go. I saw the final mock-up with all the New York Post fonts and they did a fantastic job there in production. Kenny Lopez did it and it looked so awesome. MGA: The first collection of issues from this series has been solicited. To the best of your knowledge, will it have any extras from you? MC: I have no idea. They didn't ask me for any sketches or what-nots but then again they have a lot of that stuff since i sent them jpegs. I don't imagine but you never know. 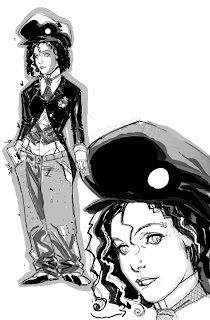 MGA: You mentioned Porcelain Doll the last time we talked, since then she's popped up, both in issue #7 and in the "looking forward" page at the end of #5 where she was labelled "The Porcelain Assassin". What is the character's name? What more can you tell us about her? 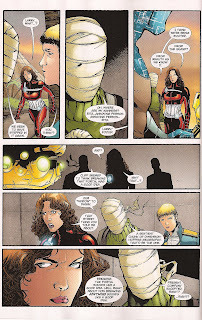 MC: From the first time I drew her and sent her to Keith [Giffen] and Liz [Gehrlein] she had the name Porcelain Doll. Right now no one has asked here her name in the book and we want everyone to know she's a assassin It's a cool title. Keith came up with a cool background after I showed him my design for a new villain. More of her tale is coming up. So no teaser except that she will have a famous grandfather. 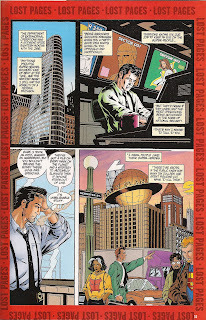 MGA: What is the current situation like in sharing issues with Ron Randall? How are the two of you deciding how to split work? MC: I pick the pages I want to draw, Crazy Jane and Porcelain Doll are all mine. Last page, so I can make sure the caption box is incorporated. It's sometimes a very difficult process and when we're behind the eightball and I've been ill and having to give up more pages than I'd like too. MGA: What are your thoughts on the new editorial/publisher announcements for DC Entertainment? MGA: Any convention plans this year? MC: Doing a show in NYC this weekend [that being the New York Comic Book Marketplace on Feb 28 I believe - DZ], Emerald City in March [this coming weekend] then New York Comic Con in October if everything goes well. I'm not a convention person for the most part. I like them but I'm not much of a traveler. MGA: If you had to explain - in one sentence - who Crazy Jane is to readers, what would you tell them? MC: 87 unique super powers wrapped into 1 person badly. As always, thanks goes out to Matthew! He's been a pleasure to work with on these interviews, and I've been enjoying the passion he's been bringing to his work on Doom Patrol. Feel free to post your thoughts for the "regular" column with Matthew Clark in the comments. 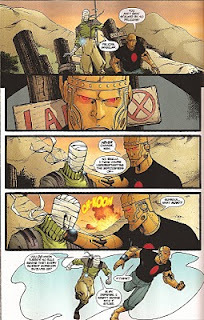 Reminder - Doom Patrol #8 today! Hey kids! DP #8 hits the stores today! It's the first "all-Doom Patrol" issue of this run, so it'll be interesting to see how it holds up. I'll be reviewing it for CBR. Another quick one as I try to get things back on track. Dan Schoening - aka Dapper Dan - artist extraordinaire and sole proprietor of Dapper Dan's Pomade drew this nice collection of the Doom Patrollers for me a while back. The version above is his first pass, the version below is a more recent follow-up. Dan's art is one of a kind, mixing Don Bluth sensibilities, Bruce Timm dynamics and a modern flair. This guy does some phenomenal stuff. Be sure to check out his site when you get a moment or two of free time. Dan's done work for LeapFrog and DC. Speaking of DC, I just now - as in right now as I'm typing this found another blog from Mr. Schoening - Dapper Dan's DC Moleskin(e)! After doing a little happy dance, I've linked it right here. 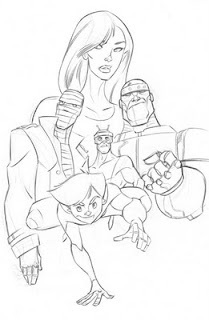 I've also got another sketch from Dan that will be posted over at Red Tornado's Path tomorrow. Consider this the MGA equivalent of a fill-in issue. 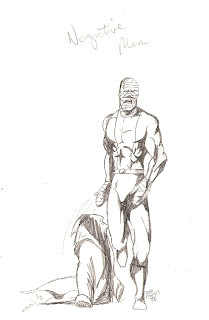 Once upon a time, there was a young man who wanted to draw comics. By once upon a time, I mean in the late 1980s. And by young man, I was maybe 16 at the time. . . Yes, that is some really bad anatomy. I'm still hoping to get back to that Showcase issue from last week's Negative Monday.